The recently-unearthed audio clip of Donald Trump bragging about groping women without permission has seriously damaged his presidential prospects — and those prospects were looking bad even before The Washington Post published the audio's content on Friday. The tape documents Trump casually admitting that he tried to sleep with a married woman and, additionally, uttering the phrase "grab them by the p*ssy." Somehow, this isn't surprising, because Trump has often ignored the fact that women, a frequent target of his bigotry, make up 51 percent of the population. It's common for candidates to accidentally say something that alienates a certain group of voters. It's less common for a candidate to intentionally say things that will infuriate over half of the voting populace, which is what Trump has managed to do time and time again. About 63 percent of voters think he doesn't respect women — and that's from a poll that was taken before Trump's 2005 comments were released. Throughout this campaign, around 70 percent of women have held an unfavorable view of Trump, according to a Gallup poll. It's hard to see how the GOP nominee can bring that number down amidst the newest "grab them by the p*ssy" tape. The fact is that Trump often seems to forget that there are, in fact, women voters, and that he absolutely needs their support if he plans on winning the presidency. He's indicated throughout this campaign, however, that he does not recognize this fact. Here are just a few examples. "Can you imagine that, the face of our next president?" Trump said of former Republican presidential candidate Carly Fiorina. "Really, folks, come on. Are we serious?" "You could tell that there was blood coming out of her nose, blood coming out of her wherever." That's what Trump said of Megyn Kelly after she confronted him about his past sexist comments at a Republican debate. When Chris Matthews asked Trump to go deeper into his anti-abortion views, Trump said that "there has to be some form of punishment" — not for doctors who perform abortions, but for women who attempt to get abortions. 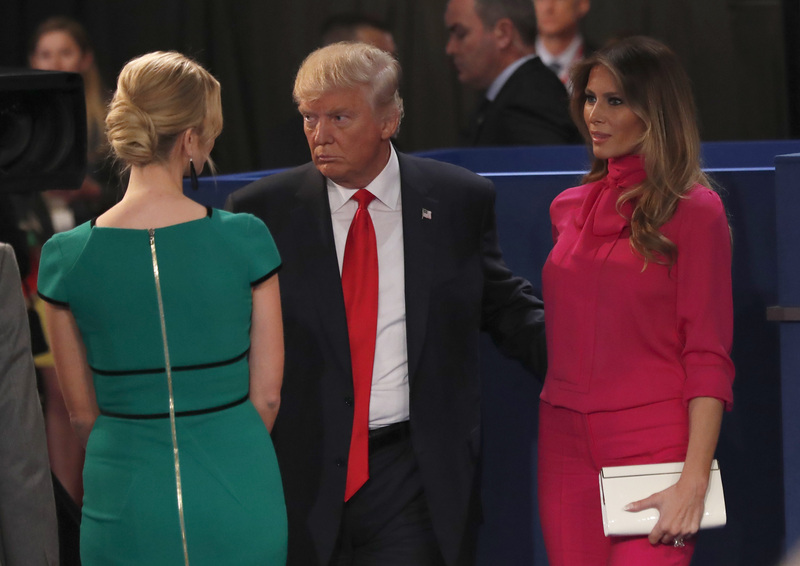 Trump said that Clinton had no grounds to criticize him on women's issues, because her husband was unfaithful to her. During the Republican primary, Trump tweeted the above image, clearly insinuating that Heidi Cruz is ugly. 6. When He Called Megyn Kelly A "Bimbo"
Trump also retweeted a user who referred to Kelly as a "bimbo." Because, you know, she's a blonde woman. Trump repeatedly interrupted Clinton while she was speaking at both of the presidential debates, even after being told not to do so by the moderators. This is an experience most female voters know all too well, and a lot of them will remember that, as well as Trump's overall appalling treatment of women, on election day.